So here we are again. Another year, another Six Nations done and dusted. Not a vintage year by any means, and our friends in the Southern Hemisphere will hardly be quaking in their boots as a result of the rugby on show. 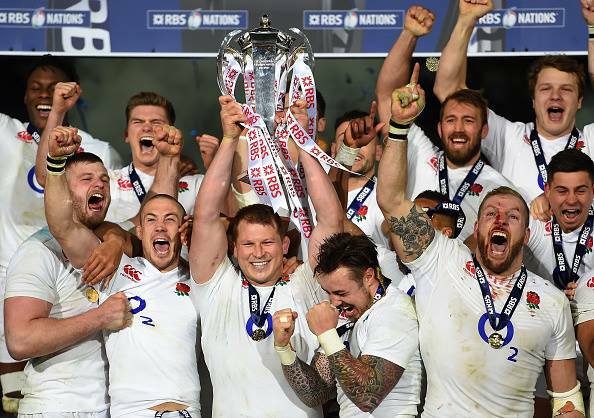 Nevertheless, a Grand Slam is a Grand Slam and, given what happened last Autumn, the England players can quite rightly feel moderately pleased with themselves. 15. STUART HOGG – getting better and better each season. 14. ANTHONY WATSON - increasingly dangerous with ball in hand and flawless under the high ball. 13. MICHELE CAMPAGNARO – if the rest of the Italian backs could reach this guy's standard they might be in business. 12. OWEN FARRELL - I said he'd be rubbish at 12. What the hell do I know? 11. GEORGE NORTH - back to his best. 10. JOHNNY SEXTON – classiest 10 on view by some distance. 9. CONNOR MURRAY - consistent excellence. 1. JACK McGRATH – cemented his reputation as a fine loosehead and looks a shoe-in for the Lions next year. 2. GUILHEM GUIRADO – France's best player by a country mile. 3. WP NEL – without him Scotland simply don't have a scrummage, he's that good. 4. MARO ITOJE– wow, what a start to an international career. A star is born. 5. GEORGE KRUIS – quietly but mightily effective in the England engine room. 6. CHRIS ROBSHAW – redemption on the blindside for England's former skipper. 7. CJ STAMPER – a major force in the Irish back row. 8. BILLY VUNIPOLA – huge impact, huge work rate, player of the tournament. 15. LUKE McLEAN - barely looked interested. 14. ALEX CUTHBERT - on current form he'd struggle to make my son's Under 13 team. 13. JONATHAN DANTY - a poor man's Bastareaud? 12. KELLY HAIMONA - makes Luke McLean look keen. 11. SEAN LAMONT - one paced and ineffective. 10. JULES PLISSON - comic genius - must have had a tenner on George North to score the first try against France in Cardiff. 9. SEBASTIEN BEZY - all the organisation and control of a headless chicken. 1. JOE MARLER – almost missed a Grand Slam decider through pure idiocy and likely to face further sanctions. 2. ROSS FORD - minimal impact for such a big man. 3. TOMAS FRANCIS – tried to defend his assault on Dan Cole's face on the basis that he had his eyes closed. Muppet. 4. COURTNEY LAWES - lacking impact and now a few rungs down the England 2nd row ladder. 5. YOANN MAESTRI - got away with a thuggish attack on Sexton and has taken over the mantle of 6N Pantomime Villain from Big Jim Hamilton. 6. SAM WARBURTON- poor on both sides of the scrum this 6N until knocked out against England. 7. ALESSANDRO ZANNI - career appears to be on a downward trajectory. 8. DAVID DENTON - makes headless chickens look as if they are all part of a cunning masterplan.